Forest maintenance is lagging in central Africa—home to world’s second largest rainforest—and this will have an adverse effect on the region’s indigenous tree species. A new research published conducted by Gembloux Agro-Bio Tech - Université de Liège and the Royal Museum for Central Africa and published in journal elife points out threat to multiple tree species. The research puts removal of humans from forests at the heart of the problem. Analysing changes in the region since around 1850, it says, that the population of rainforest’s light-demanding trees started diminishing after colonials pushed people out of forests and towards roads and rivers. The study focuses on four light-demanding species of the rainforest—T. scleroxylon, E. suaveolens, Macaranga spp., Myrianthus/Musanga type and E. guineensis. The researchers say that before the mid-19th century, many people lived in the forest and their activities created clearings that turned the forest into a relatively patchy landscape. This allowed young trees to receive ample light and mature. “This disturbance is needed to maintain certain forest habitats and tree species, including light-demanding species of tree. 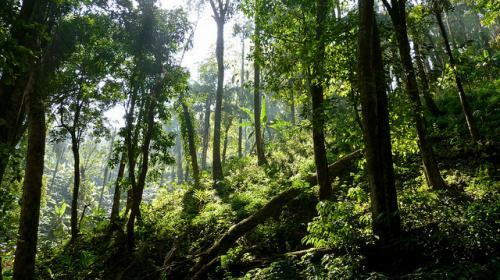 Common logging operations do not create openings large enough to guarantee that such species will be able to establish themselves naturally,” the report says. A number of trees belonging to the four said species in the forest area are aging. At the same time, few young trees are growing to replace them, building the risk of disappearance. Researchers suggest that complementary activities are necessary to ensure regeneration. “These might include selectively logging mature trees around young members of light-demanding species, or planting threatened species,” the report says.